Baazaar movie starring Saif Ali Khan, Chitrangada Singh and Radhika Apte. Directed by Gauravv K. Chawla. Baazaar movie tells about Mumbai stock market. Paisa uska jo dhandha janta ho aur main hu dhandhon no gando chhokaro. "Yes, this is the dialogue of Shakun Kothari's (Saif Ali Khan) movie baazaar. Gujarati Billionaire Businessman, Kothari is a clever and shameless businessman. The film has the most powerful scenes in which, during religious activities in an auditorium, Shakun takes a family business cleverly capturing and makes a dramatic announcement in this event. Shakun's personality is full of both good and evil. While on one side Shakun continued his Dirty game in the stock trading of Mumbai. On the other hand, Allahabad has a young stock broker, Rizwal Ahmed (Rohan Mehra) who worships Batra and wants to be like him. Who believes that his small town mentality can not prevent him from becoming like his idol. Soon Rizwan travels to Mumbai. It is clear that he has come here to settle down not to struggle. After this, Rohan gets the chance to work under the underpinnings with the help of co-worker and girlfriend Priya (Radhika Apte), who is a great stock broker. Rohan also succeeds in winning the trust of Shakun. Both Shakun and Rohan are very different from each other. Shukun himself in a film says, 'You works on emotions, I work on math calculations' but the difference between them can not stop them from joining hands. Gradually, Shagun realizes that he is going to pay dearly for this hunger to move forward. Saif Ali Khan's character Shakun in one scene says, 'There is only one difference in defeat and victory, hunger.' This dialogue completely defines the market. Gaurav chawla has done a great job of making a film on difficult but interesting topics like stock trading. 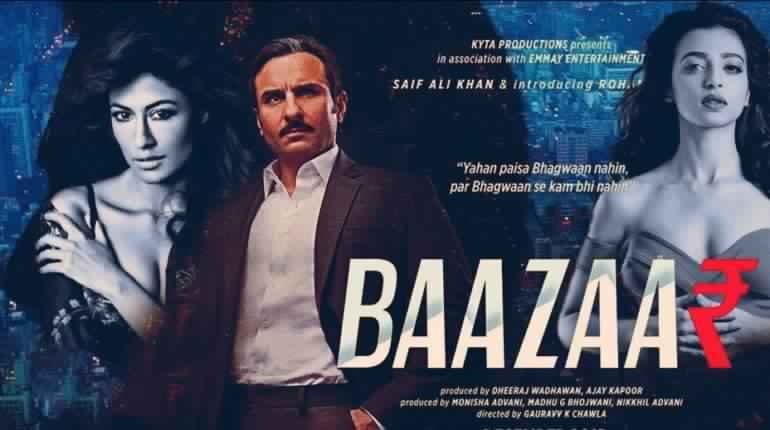 Saif Ali Khan's superb performance baazaar makes money collection for audiences. Many things related to the stock market seem to be missing in the film. However, the film still succeeds in keeping the audiences confined to the screen. Credit goes to Saif Ali Khan's superb performance. From our side Baazaar movie has given 3.5 stars. Comment us to share your experience about this movie.